If you own a Jeep, then it’s a good idea to think about joining a Jeep club. Some Jeep clubs are well-structured and have membership rules (and possibly even fees which go toward group events). Others are loosely structured and have a "come and go as you please" attitude. 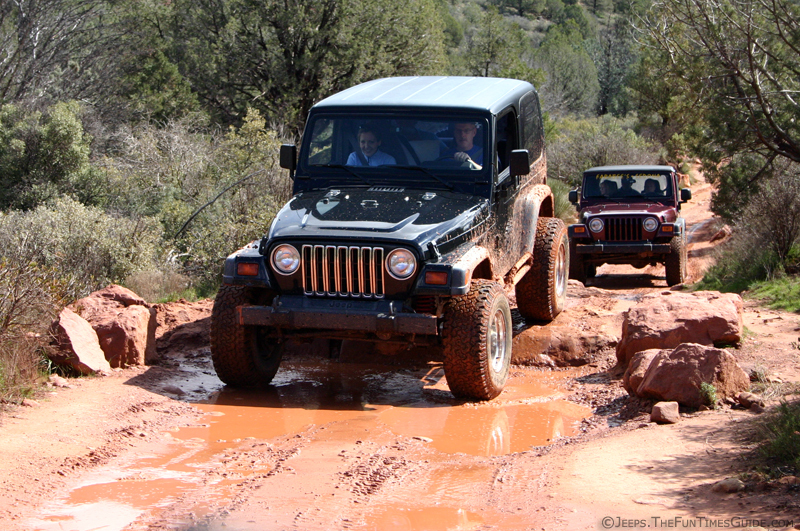 #1 Jeep clubs are a great place to learn the basics of 4-wheel driving offroad. If you’re new to off-road driving, it makes a lot of sense to hook up with others who’ve "been there, done that". Not only will they help to make your first few times offroad more enjoyable, they’ll also help you learn how to stay safe (especially if you want to push the limits a bit) and have fun at the same time! #2 Organized club rides give you more options than you’d have on your own. Chances are, the more you’re in the company of fellow Jeepers, the more you’ll learn about some new trails & places to ride that you didn’t even know existed. Plus, you might even get access to some riding areas that you wouldn’t have been able to gain entry to on your own. Club membership opens many doors for Jeep owners. #3 Jeep clubs are a great way to find others to go riding with. As you know, you should never venture offroad or into the backcountry by yourself. And when you’re part of a Jeep club, it’s always a cinch to find someone who wants to go out and ride. While a Jeep club may be one of the best ways to socialize with other Jeep owners, the fact is… if you’re not exactly a social butterfly (self included), you’ll still feel at ease participating in a Jeep club event. There’s just something about Jeep owners that’s super hospitable. You know that "Jeep wave" thing?… we’re just a friendly bunch. #4 We can accomplish more together than alone. Most Jeep clubs are active in their communities, and almost all clubs are helping to prevent trail closures in one way or another, as well. Organized club activities help to improve the image of all 4-wheelers and Jeep owners alike, which only serves to benefit the sport of offroading. If you’ve decided that you do, in fact, want to join a Jeep club, the next question becomes, Which one? Chances are, there are probably a handful of Jeep clubs in your area to choose from. Size of Club – Larger Jeep clubs tend to be a bit more organized, have more activities, and have a solid network for contacting fellow members. Smaller Jeep clubs are usually less organized and much more informal. Sometimes it’s harder to get things going in smaller clubs because some don’t take the "club" aspect as seriously as those in larger clubs might. Age of Members – You will find everything from 20-somethings to retirees who are members of Jeep clubs. The point is, you will probably feel most comfortable in a club with lots of members around your age range. Younger clubs tend to spend more time on more difficult trails & terrain. Older clubs tend to travel farther from home and participate in more overnight activities. Level of Participation – It is important that you ask about the amount of participation that is "required" of club members before you join. Some Jeep clubs make it a requirement that members attend a certain number of meetings and/or attend a certain number of activities each month. The plus-side to this is that such clubs tend to have a very tight network of members and camaraderie like this is hard to find. Trips & Events – You’ll also want to know what types of trips the club typically plans. Do they participate in frequent overnight activities? Lots of day trips to nearby cities? Out-of-state events? Or is most of the riding done locally? Community Involvement – Ask how much community service and trail maintenance they sponsor in the area. For example, a number of Jeep clubs hold fundraising events in support of a local charity. And the most reputable clubs proudly participate in trail maintenance programs and support local environmental issues. Philosophies – Finally, most (though not all) reputable clubs tend to belong to their state’s four-wheel drive association, as well as the national four-wheeling association. Membership in these organizations means that they subscribe to the basic philosophies associated with the Tread Lightly program, in addition to a number of other safety and environmental matters that help to promote offroading as a safe and meaningful sport. In sum, 4-wheeling with fellow Jeepers gives you an opportunity to fine-tune your off-road driving skills in a safer environment, while providing you with an opportunity to meet other people with similar interests as yourself. Take some time to find the right club for you — one that meets your offroad skills, and also has members that enjoy some of your favorite offroad activities.